Rob Hearit serves one of his customers. 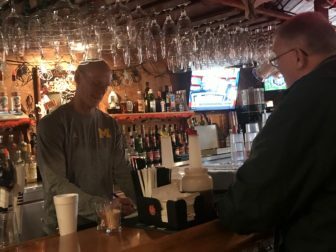 Rob Hearit, owner of Darb’s Tavern & Eatery, has been in business for 37 years at his family owned restaurant, and every Saturday night serves his customers live music as well as food. The restaurant offers a variety of cuisines. Options include: burgers, pizzas, strombolis, steaks, and an array of Mexican food. Hearit said the restaurant has a pub style menu and offers a big variety. It also has a full bar with eight beers on tap and nightly drink specials. Rob’s wife, Leanne, is also an owner. Waitress Nicole Orrin said,“I like working at Darb’s because it’s a laid-back environment and it’s small, so you get to see familiar faces,” said Orrin. Christine Harrison, a Mason resident, says Darb’s is a favorite for her family. For information about specials and to see what groups will be playing, check out Darb’s website. Hours are1 a.m. to 11 p.m. Monday-Thursday; 9 a.m. to 2 a.m. Friday-Saturday, and 9 a.m. to 11 p.m. Sunday. Madison Loney, originally from Commerce Township, is a junior at Michigan State University in the School of Journalism with a concentration in media relations. She has interned at the Spinal Column Media Group as a local writer. You can also read Madison's posts on Spoon University, an online college student ran blog all over the world.